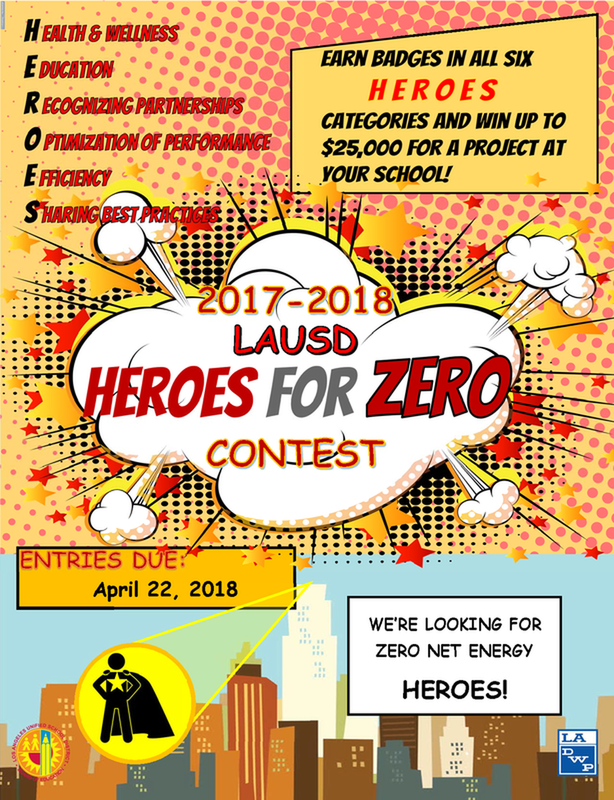 Sustainability Initiatives Unit announces the 2017/2018 HEROES for ZERO Contest! HEROES for ZERO challenges K-12 student teams to help make their schools “Zero Net Energy (ZNE) Ready” by reducing energy consumption, maximizing energy efficiency, and educating fellow students and staff. Teachers are encouraged to connect ZNE activities with STEAM curriculum. Teams will earn badges in six HEROES categories, and schools can win up to $25,000 for a sustainability-related project at their campus! ​​Zero Net Energy (ZNE) schools are ultra-efficient and consume only as much energy as they produce from clean, renewable resources. In addition to lowering energy and operating costs, ZNE schools can result in improved student health and productivity. ZNE schools can also serve as teaching tools, providing opportunities to learn about sustainability, high performance design, and emerging technologies like renewable energy generation and storage. Click here for Flier and Contest Rules. Check out a variety of resources for energy-related curriculum and learning activities in our Resources page! Energy Conservation Guide: this resource provides schools with the information and tools necessary to develop, implement, and track campus-wide energy conservation campaigns. Zero Net Energy Certificate: this project based learning curriculum leads students through creating a school zero net energy design proposal. Curriculum sections can be used separately or in any order. (High school level). Energize Schools can further support high school teachers through planning and in-class instructional support from our expert staff. Request resources here. Learn more here. Division of Instruction has provided NGSS Alignment for Heroes for Zero. Register for Heroes for Zero! Eligible Schools: District schools or affiliated charter schools located on a District-owned site for which LAUSD pays the utility costs.